The photo on the left was taken in the early 1900s. 15 The Plain is the property in the middle of the photo with the lower roof than the two on either side. 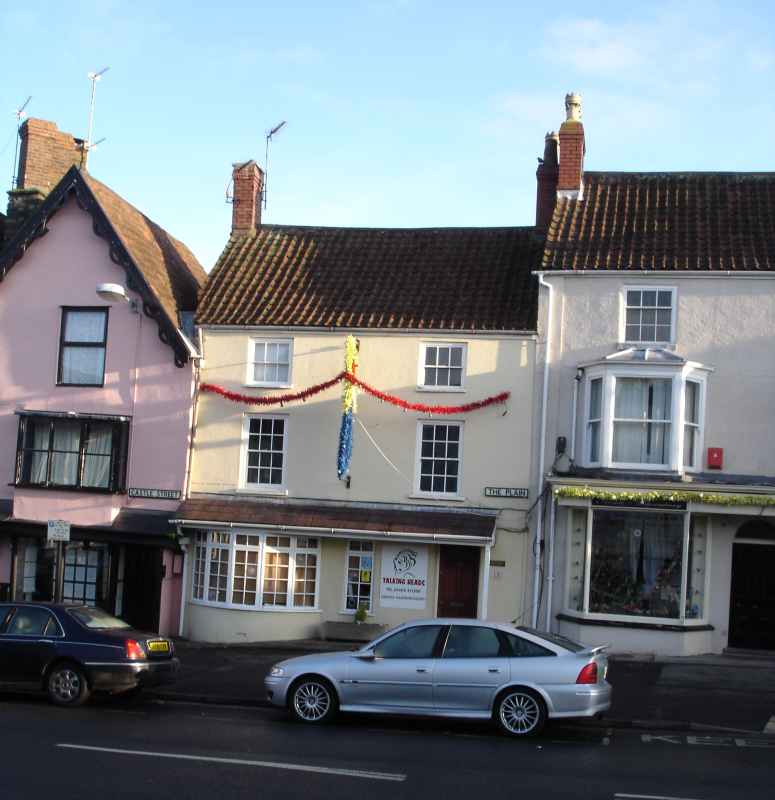 It was then being used as ‘Southcotts Hairdressing Saloon’ and it is possible to see the barber’s pole above the door. There is another photo at the bottom of the page taken in 2008. It was still being run as a hairdressing business then called ‘Talking Heads’. 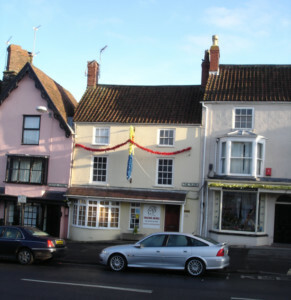 The frontage of the building was changed from double fronted shop windows to the present arrangement with the door to one side of a large window about 1973 when the hairdressing business was being run by the Iles family (Bert and son, Tony) who were associated with the building for about 50 years. We don’t know when the house was built or anything about its early history. Our earliest source is the 1840 Tithe Survey which shows that the house was Plot 263, a house and garden owned by John Birt and occupied by John George Dyer. Joseph Smith – the rate books from 1867 onwards show that Joseph owned 15 The Plain. The 1851 census shows that Joseph and his family were already living there at that time. It shows Joseph Smith was a journeyman saddler aged 24 living with his wife, Sally aged 25, their son Leonard aged 2 and a cousin Elizabeth Pritchard an assistant milliner aged 17 from Thornbury. We think that Joseph was baptised on 14th October 1827, the son of Thomas Smith, a tailor and his wife, Sarah. We do not know at this stage whether Joseph is the son of the Thomas and Sarah Smith whose first children were born over 30 years earlier. In the 1841 census Joseph was an apprentice saddler aged 13 working with William Embley in the High Street. In March quarter 1847 Joseph married Sally Olive in Bristol. Sally was Sarah, the daughter of Robert and Mary Olive. In 1841 Sally was a straw bonnet maker living in High Street, Bristol. Joseph and Sally’s son, Leonard, was baptised in Thornbury on 3rd June 1849. They had a daughter, Mary, baptised on 21st August 1853 who died on 14 March 1856 aged 4 years 6 months. The 1861 census shows Joseph was working away from home. He was working as a saddler and lodging in Didmarton village in Gloucestershire. Sarah was working as a milliner aged 34 and living at home in 15 The Plain with their son, Leonard aged 11 and a servant Ellen Cottrel aged 13 from Alveston. In the 1871 census Joseph was a saddler aged 44 from Thornbury living with Sarah a milliner aged 44 from Thornbury, Sarah’s mother, Mary Olive aged 74 and a servant, Mary Summer aged 14 from Grovesend. On 25th September 1880, the property at 15 The Plain was put for auction. The sale details shown in the image on the left show that the shop at 15 The Plain had been used for Sarah’s millinery business. The property was sold to ‘W. Harris’ for £305. The 1880 rate book shows Joseph had moved to one of the buildings at 14 High Street (the building adjoining the back lane running between The Lion and the Toll House). It appears from the census records that Joseph and Sarah may have run into marital problems. In the 1881 census Joseph was living at 14 High Street. Sarah was living in Brighton working as a housekeeper with a cousin, Edward Garrett. The 1891 census shows her still there and she has been joined there by Ann Olive, her sister (which confirms we have identified the right person in the census). Joseph was still living at 14 High Street in 1883 according to the deeds of that property. The 1885 rate book shows Joseph was the tenant of a little house which later became part of 7 Silver Street. By the time of the 1891 census Joseph was lodging with Robert Sargent in 13 St Mary Street. It is interesting to note that Joseph is described as a widowed saddler aged 64 although his wife is living elsewhere. Joseph died on 3rd August 1891 aged 64 and was buried on 6th August 1891. A newspaper report of March 3rd 1890 recorded that Sarah Smith had bought a house (later known as 7 Castle Street) in Thornbury. She paid £120 for the property. The 1901 census shows Sarah Smith living at 7 Castle Street as a widow aged 76 also living on her own means. This is interesting because Sarah Smith was the daughter of Robert and Mary Olive, baptised on 29th June 1825. Sarah’s mother, Mary Olive had come to live in this house in 1860 when she too was an elderly widow. The South Gloucestershire Chronicle of Friday June 16th 1916 carried a report of the death of Mrs Joseph Smith, the widow of the late Mr Joseph Smith of Castle Street. The article said that Mrs Smith was in her 92nd year and had lived in Thornbury all her life. The mourners at the funeral included her brother Mr Olive and her grandson Leonard Smith. Messrs T C Smith and F Gayner also attended the funeral. W. Harris – the Bristol Mercury reported that ‘W. Harris’ bought the property from Joseph Smith on 25th September 1880. We are not sure which W. Harris this refers to. The deeds of 24 Castle Street show that Doris Lucy Anstey of Falmouth bought the hairdresser’s shop “in the occupation of Eric Hubert Iles situated on The Plain” and 24 Castle Street. This took place on 29th September 1956. It looks likely therefore that following Francis’s death in 1923, his widow, Lucy, continued to own 15 The Plain until her death in 1955 when her daughter, Doris Lucy, bought the property off the estate. We have information about some of the occupants based on the electoral registers and trade directories.